HOUSTON, TX--(Marketwired - February 26, 2016) - A Houston dentist is encouraging patients and community members to consider new research that shows the far-reaching effects of tooth loss. Dr. Behzad Nazari said while many patients are aware that losing teeth can impact the smile and decrease the ability to chew, researchers have recently found that tooth loss also can have negative consequences on a person's physical and mental health. "We can treat patients with missing teeth, but we hate to see our patients go down that road in the first place," said Dr. Nazari, who operates Antoine Dental Center. "Preventive dentistry helps reduce risks of tooth loss and can keep your smile beautiful and bright." The latest information regarding the effects of tooth loss comes from a study conducted by Dr. Georgios Tsakos at University College London. The study looked at more than 3,100 English adults ages 60 and older. The findings showed that patients with tooth loss had a decline in ability to walk and their memory by about 10 percent. Dr. Nazari said patients who lose their teeth can experience adverse health effects, but added that there are solutions to replace teeth at his dental practice. The office offers traditional tooth replacement options like bridges and dentures, but also provides dental implants for patients with missing teeth. Dr. Nazari said dental implants have become the preferred method of correcting missing teeth. The implant is made from titanium and naturally joins with the jawbone. Once the implants join with the jawbone, Dr. Nazari can restore the implant with a dental crown or dentures. "The implants are nearly as good as natural teeth and are the best way to avoid adverse health problems because of missing teeth," Dr. Nazari said. "Our patients are amazed at how strong their implants are and relieved to finally eat the food they love again." Antoine Dental Center is a multi-dentist practice that offers comprehensive care in general dentistry, restorative dentistry, traditional orthodontics, short-term orthodontics, Invisalign, cosmetic dentistry and dental implants. 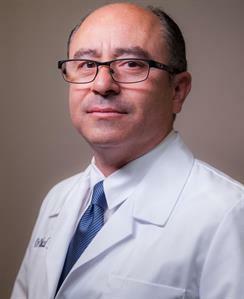 Dr. Nazari started his career in health care as a pharmacist after graduating from Texas Southern University in 1991. He then switched career paths and graduated from the University of Texas School of Dentistry at Houston in 1998. Dr. Nazari founded Antoine Dental Center in 2000 as a dental practice that can treat patients of all ages. Dr. Nazari has completed more than 1,500 hours of continuing education, taking a special interest in orthodontics and TMJ treatment. He has completed continuing education courses in dental implants, orthodontics and cosmetic dentistry and is a graduate of Kois Center, a dental continuing education program in Washington. Dr. Nazari holds memberships with the Academy of General Dentistry, the American Dental Association, the Greater Houston Dental Society and the Texas Dental Association. In addition to Dr. Nazari, Antoine Dental Center practices with orthodontist Dr. Wael Kanaan, prosthodontist Dr. Simon Samo and periodontist Dr. Eric Choudhury. To see more of Dr. Narazi's dental implant solutions or hear from his dedicated patients, visit his website www.antoinedental.com or call the office at 713-364-8990.